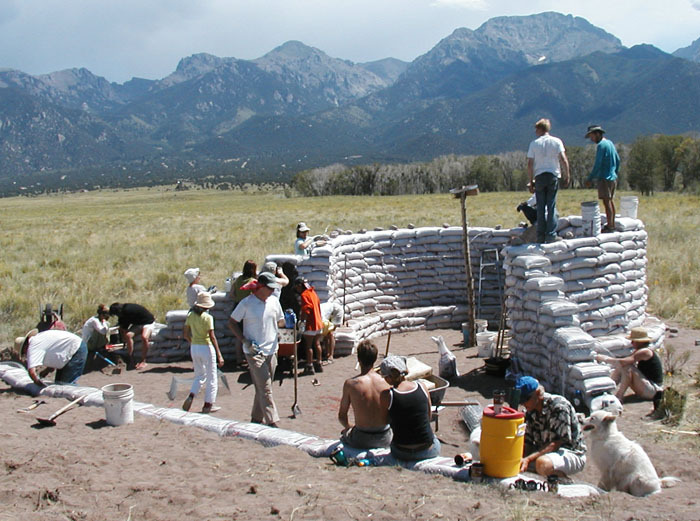 I accepted a wonderful challenge when I was asked to facilitate the creation of some sort of monument with about thirty people attending the Second Vittachi International Youth Gathering, held in Crestone, Colorado in early August of 2003. The expected attendees were from all over the world: the Philippines, Zimbabwe, Bhutan, Bangladesh, Nepal, China, Canada, Niger, Lebanon, South Africa, Cambodia, Indonesia, Cameroon, Poland, Jordan, New Zealand, Australia, UK, Brazil, and the USA. Unfortunately, not all of these countries were represented because of problems in getting visas from the U.S. government. My challenge was to imagine a project where people from such diverse backgrounds could cooperate in building something that would require little specialized skill and could be accomplished over the course of just a few days. The place where part of this conference was to be held was a large parcel of mostly undeveloped land known as Atalanta. A tent structure would provide shade for some of the events, while others would occur under the Cottonwood trees along a small creek. I chose a site right at the base of a lovely symmetrical hill to build what we decided to call the "Glorieta," which means an arbor or shade structure in Spanish. Our Glorieta would be a sort of glorified gazebo that would emerge directly from the soil beneath our feet. Since the conference was about sustainability, I felt it was important to honor this by using local materials as much as possible. With my experience in building with earthbags (recycled misprinted polypropylene rice bags), I knew that it was possible to fill these bags with the fine sand that the entire hill was composed of, and create an actual building. 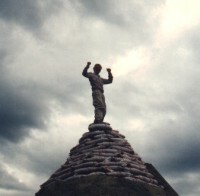 As long as the bags of sand were stacked vertically, rather than inclined as for a dome, the structure should be plenty stable. Part of my plan was to terrace the hill in such a way that the soil removed in the excavation would be used to fill the bags. This terracing would then create a natural amphitheater, with the Glorieta serving as a sort of stage area for performances. To accentuate this function, the Glorieta has buttress wings that open out toward the amphitheater and an opening wide enough to accommodate a small musical ensemble that would be in full view of an audience. At any given time there were about a dozen people working on the project, and this was only for about three hours each morning, for a total of five days. 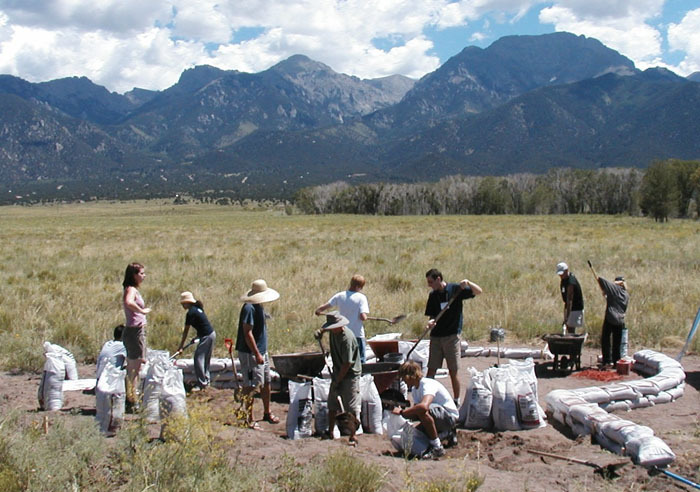 One of the bigger challenges was to coordinate this many people to work smoothly as a team. I divided up the tasks so that some cleared weeds and brush, while others dug sand and filled bags, cut wire or twine (to hold the eventual chicken wire for the stucco), placed the bags and tamped them flat. It was a very industrious group effort, and it was amazing to see the structure actually rise out of the dust! Another function of the Glorieta is to provide a shady place to socialize, convene classes or workshops, or simply be contemplative. For this reason I designed built-in benches both inside and outside the circular structure. 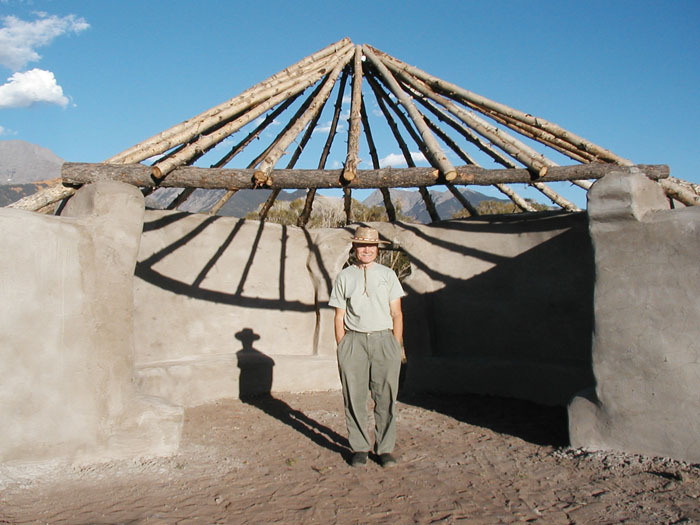 The shade would come from a conical roof framed with small cottonwood trees that had died from a previous drought, and even smaller branches that would be woven around these rafters. 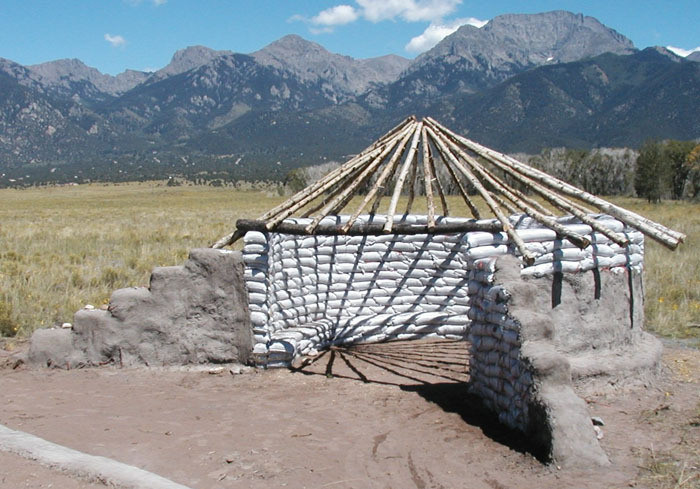 This roof structure would be self-supporting, with the small ends of the trees wired to a central steel hoop, and the larger ends pinned to the earthbag wall with lengths of steel rebar. Barbed wire embedded between each course of bags serves to keep the circular wall from expansion from the outward force of the rafters. The above photo shows the structure tarped to keep the sunlight off the bags while not being worked on. It became apparent after a couple of days work that the Glorieta was not going to be complete by the end of our allotted time. 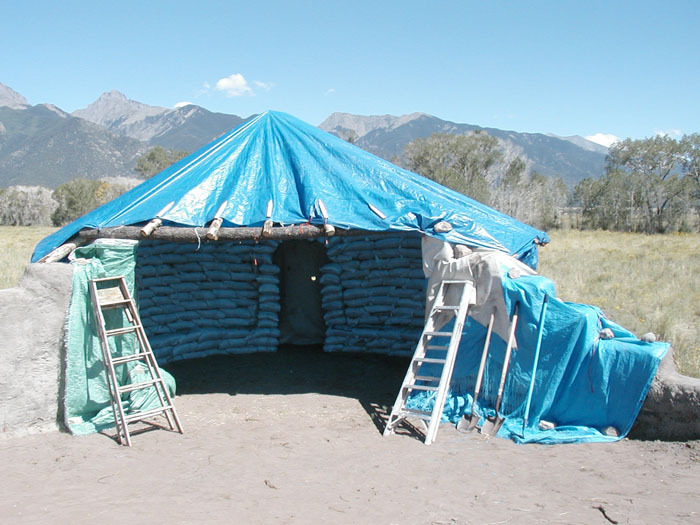 We actually did get all of the bag walls erected, but did not finish the roof nor get much of the stucco up. This stucco was made from the same onsite sand, mixed with some Portland cement. 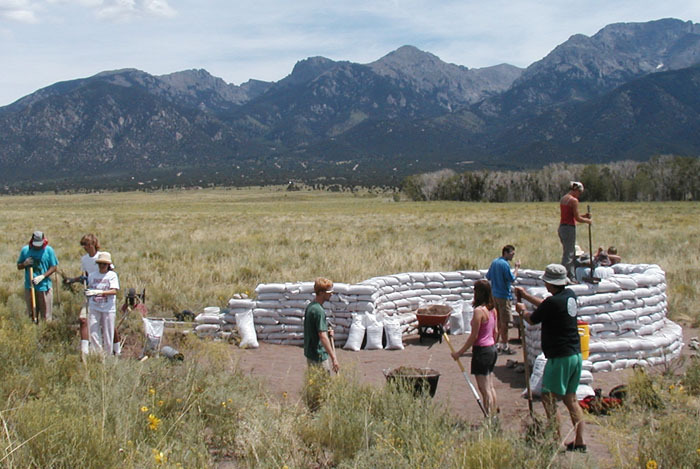 Only one of the earthbag benches that serve as retaining walls for the terraces was created. I thought that we would need to dig much more soil than this to fill all of the bags. While most of the effort of building the Glorieta was very hard work, there was also an atmosphere of much joking, singing, and chatting. Lots of fun was generated by many successful attempts at walking across the horizontal beam suspended about seven feet above the ground at the main entrance to the Glorieta. 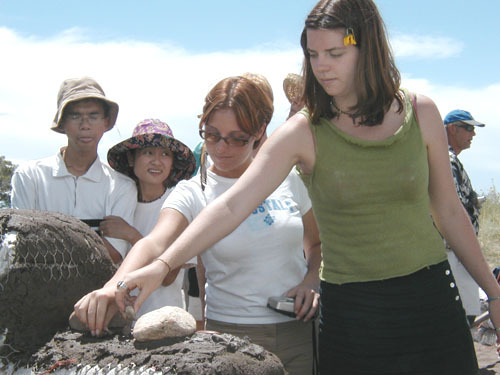 Towards the end of our time there was a satisfying moment when all the participants had an opportunity to embed a rock, shell or other personal item brought from their country for this purpose. This will be a permanent memento of the wonderful event that spawned the Glorieta. Another moment that generated some excitement was when we removed the wooden arch form to reveal the self-supporting earthbag arch over the back entrance to the space; this always seems like gravity-defying magic. This same concept for building could be used to create an emergency shelter or a small home. The Glorieta project was only one of many facets of this conference, but several people told me that for them it was a high point. Physically creating a functional and aesthetically interesting structure out of little more than the dirt under your feet and a few small dead trees is a memory that these folks will keep for some time.